Description: NS Local Train A48 rounds the curve at Kellyton, AL on it's way East to Columbus, GA. Description: NS 175 rolls south at mp80 on the Marion Branch. Where is the sun when you need it most? Description: Perfect time of day for southbounds, where is the sun when you need it? Actually, it was just starting to rain at this moment. Description: NS 175 rolls past mp 80 just as the rain starts to fall. Description: Waiting in Milan Yard with a train of auto racks and boxes. 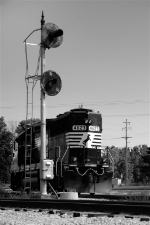 The track to the right of the train is the Ann Arbor RR mainline between Toledo and Ann Arbor. Description: NS 4623, one of the only 36 GP59s made, pulls a twenty car cut of loaded coil cars out of Pro-Tec. Description: NS L7N ducks into the siding at Miller City to meet eastbound Triple Crown train 262. Description: NS L7N pulls back onto the former NKP main and heads toward Fort Wayne. 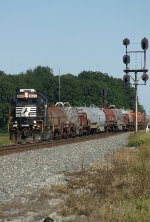 Description: NS 4623 and NS 3468 work at the ethanol plant in Bluffton. Description: Some geeps with a load of grain. Description: Various NS power gets fueled at Homestead yard.